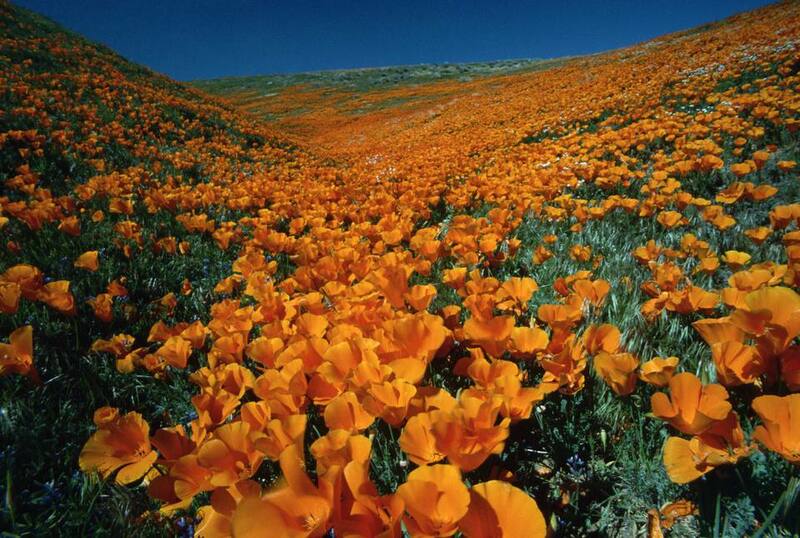 California's state flower, the golden poppy, blooms throughout the Mojave Desert region but the concentration is highest in the 17,600-acre Antelope Valley Poppy Reserve, where eight miles of trails wind through the gentle rolling hills, making the park a wonderful place for families to hike and explore. Spring is a gorgeous time for a road trip through Texas Hill Country as bluebonnets are blooming wild in fields and along roadsides far as the eye can see. The region comprises a large central swath of the Lone Star State including Austin and San Antonio as well as smaller towns such as Bandera and Fredericksburg. The Lady Bird Johnson Wildflower Center at The University of Texas at Austin has a mission to protect and preserve North America's native plants and natural landscapes. Families can tour the center’s many trails of beautiful wildflowers and learn how to grow and conserve native wildflowers. To find wildflowers on your own, the Texas Department of Transportation maintains a website of current wildflower reports and sightings. The hottest and driest place in North America can be a hostile place during the summer. Yet Death Valley National Park can be an entirely different story in the spring, when the temperatures are mild and the desert valley dons a cloak of wildflowers. Kids can become Junior Rangers at the park. Washington State's Skagit Valley is deservedly famous for its tulips, which draw legions of admirers and photographers every spring. Come for the annual tulip festival, held throughout the entire month of April, or consult the bloom map to catch the peak tulip colors. Spring is easily the best time for wildlife viewing in Yellowstone National Park, as the annual baby boom brings adorably gangly young elk, fuzzy orange bison calves, and cute grizzly and black bear cubs. Kids can become Junior Rangers at the park. The iconic Skyline Drive runs 105 miles along the crest of the Blue Ridge Mountains, from one end of Shenandoah National Park to the other. The roadway is at its most sublime from April through June, as dogwood, redbud, pink azaleas, and mountain laurel take turns showing off their blossoms. Just outside of Tucson, mountains meet desert in Saguaro National Park, named for the enormous cacti that can grow up to 70 feet tall. Take the eight-mile Cactus Forest Scenic Loop Drive for scenic vistas and trailheads for hiking paths. Late afternoon to early evening is the best time to witness the night-blooming white and yellow flowers. Kids can become Junior Rangers at the park. Though only nine miles long, the Brockway Mountain Drive packs in breathtaking views of Lake Superior and the jagged cliffs along the Upper Michigan coastline. As the highest drive between the Rockies and the Alleghenies, this Michigan Wildlife Viewing Area is a superb place to witness the annual migration of birds of prey along the length of the Keweenaw Peninsula headed across Lake Superior each spring.